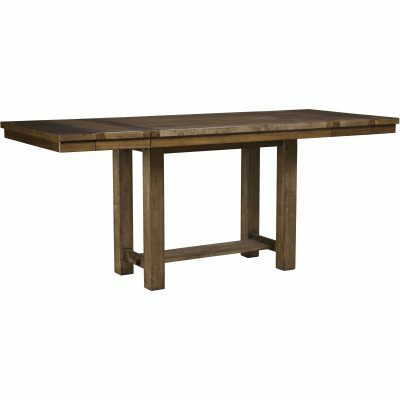 Craftsmanship with attention to detail makes the Collenburg counter height extension table perfect for casual dining. Simply add in the separate leaf for more space at the table. Its rich brown finish and decorative nailhead trim adorn this table with beauty. The braced legs, metal accents and lower shelf create a robust look with a hint of industrial style. Table depth with leaf: 78.13"
Table depth without leaf: 60.13"
Please note Free In-Home Delivery is for the main level only. Delivery to the upper and lower levels are is extra. Please Contact Us if you require delivery to the upper and lower levels. After placing your order, you receive a confirmation email from our sales team that your order has been placed is now being processed with the manufacturer including the time you should be expecting delivery. As your delivery dates get closer, you will be contacted in order to set up a delivery date and time at your convenience. Orders under $800 are subject to a flat rate delivery cost of $120 if you live within the postal codes mentioned. If you live outside of the postal codes mentioned and/or your order is under $800, you may pick up your item(s) from our warehouse in 8400 Woodbine Ave, Markham, ON L3R 4N7 free of charge. If you live outside of the Greater Toronto Area, please Contact Us for delivery. We may offer free delivery for larger orders so please get in touch. There are a few important things to keep in mind when returning a product you purchased. You can return unwanted items by post within 5 working days of receipt of your goods. You have 5 calendar days to return an item from the date you received it. There will be a restocking fee of 25% of the purchased price of the product. We underline that the Buyer is responsible for the return shipping costs. For more information, view our full Terms & Conditions information.